On April 26, the president signed an executive order that will directly impact Kern County. This order demands a review of designations, including national parks. President Donald Trump and Secretary of Interior Ryan Zinke claim this act has been abused for political gain rather than used for public interest. On May 5, the Department of Interior released the list of which monuments will be “reviewed”. Although the verbiage of this order seems simple and is only intended to review national monuments, there’s more to the story. Zinke was instructed to review these monuments in order to give Trump recommendations on which monuments should be rescinded, reduced or modified. This puts all 27 monuments on the list at risk, including the Giant Sequoia National Monument which reaches Kern County. There’s many reasonable worries coming from California residents in response to this review. One major fear is the cutting of the forest. When the Giant Sequoia National Monument was first created by George H. W. Bush, it was 90,000 acres. Under Bill Clinton, this monument was expanded from 90,000 to 328,000 acres. The Trump Administration wants to size it back down to 90,000 acres because they claim there is a wildfire hazard with how big the monument is now. Many of Californians, especially environmentalists, do not buy this explanation. A major concern is that the cutting down of the trees will greatly affect the ecosystem. If the monument is opened up to logging, the ecosystem can and will change. The area can become drier and hotter, which would not be wise. Although California is no longer in a drought state of emergency, limiting the size of a forest in central California could be damaging in the future. 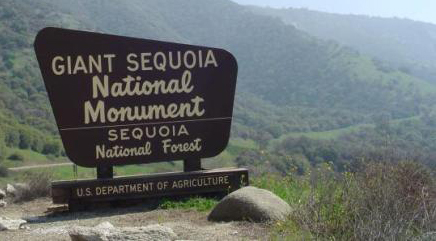 The Giant Sequoia National Monument touches much of the central valley. The central valley was an area highly affected by the drought, considering the location and amount of agriculture and groundwater that had to be used. Cutting back 238,000 acres could cause catastrophic damage, most certainly in the case of another drought. Another major fear is that this monument, along with several others, will be cut back in order to search for minerals. Kern county is especially known for its underground sums of fossil fuels and natural gas. It is assumed by many skeptics of this order that these monuments will be cut just to access these underground resources. This is extremely alarming when Kern County already is one of the top producers of oil in the country, so why more? It’s extremely alarming to environmentalists and progressives who want to expand solar, hydro and wind power and not use more oil. There are many consequences caused by this order that could cause great damage to the environment not only in California, but in our very own Kern County. What? That’s nuts! We are activily planting trees in communities to combat air polluton and Trump wants to cut more than half of Sequoia National Forest that contains some of California’s largest GHG absorbers. I really hope that we fight this!